Product #21140 | SKU 583961 | 0.0 (no ratings yet) Thanks for your rating! 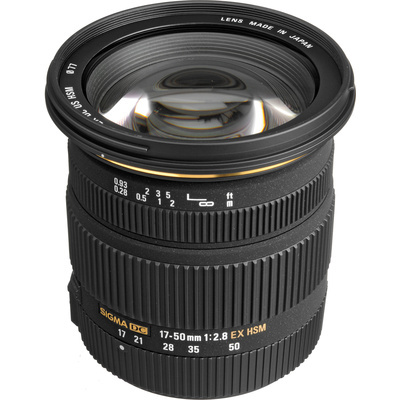 The Sigma 17-50mm f/2.8 EX DC HSM Zoom Lens for Pentax DSLRs W/APS-C Sensors is an incredibly versatile, lightweight, and compact lens designed specifically for Pentax digital SLR cameras with APS-C size sensors. The lens has a fast f/2.8 maximum aperture throughout the entire zoom range. It features a construction of 17 elements in 13 groups with glass that corrects for flare, ghosting and all types of aberrations. It produces high contrast and sharp images throughout the zoom range even at its maximum aperture. This lens is also equipped with Sigma's Hyper-Sonic Motor (HSM) which provides for fast and quiet autofocusing. This lens is for use with Pentax digital cameras with APS-C size sensors only.